Provides convenient, effective germ-kill that works to kill harmful disease-causing germs, yet is gentle on hands. Kills 99.999% of pathogenic germs in as little as 15 seconds. Effective against bacteria, yeast and molds. Dermatologist-tested and hypoallergenic formula. Fragrance- and dye-free. Contains added moisturizers and skin conditioners to soften and smooth hands. 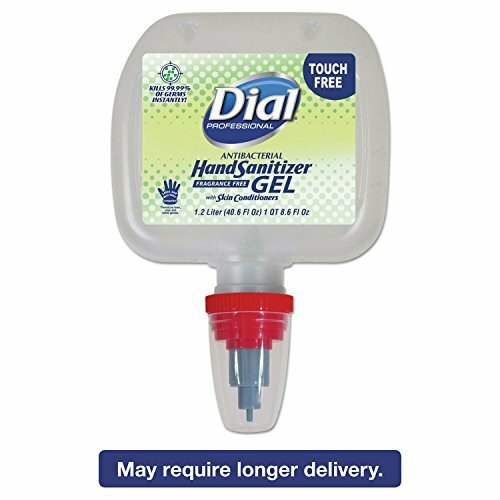 Hand Sanitizers Type: Gel; Color(s): Clear; For Use With: Dial Duo Touch-Free Dispensers; Capacity (Volume): 1.2 L.